Now everyone have their Laptop and mobile phones but what happen if you lose it which you bought for high price?. Laptop and Cellphones are created for mobility, so it nature to lose it somewhere. Today here i am going to tell the steps to find your Computer, Laptop, Mac Book and mobile which you lost. Prevention is better than Cure. So prevent before you losing your laptop or Mobile. So here i am going to guide you how to protect your laptop to be stolen and to get back. All you need to install PREY simple Free open source application (pro versions also available) which runs in the background which won’t take more resource of your computer or mobile. Its really helpful to track our Laptop and mobile easily. Lets see how it works on Laptop and how to configure it here. Prey Project is the Open Source, It Runs in the background as System Service so you can not able to see the running application in UI of your Operating System. Prey Supports MAC, Windows, Linux and Mobile Platforms too. 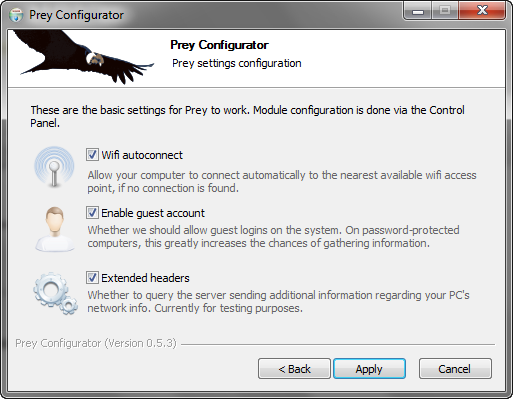 You have to Install and Configure the prey client in your devices for one time. Thats all. How Prey Works, If Your Laptop or Mobile Stolen from you. Just go to some computer which having Internet Connection. 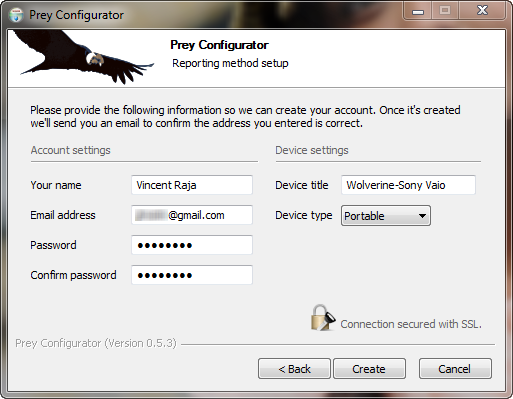 You have to open Prey Web interface and Sign in your account which you created while installing the client in your laptop. Now you can get the Web Interface how to Track your stolen Laptop. Just change the settings that your laptop is stolen and Save the settings and Wait. Your Laptop will auto connect to near open WiFi connection and mail you the Location and Theif’s identity and more. Let me Explain how to Configure Client and Track your Stolen Laptop below. Select REPORT SETTING METHOD and select Recommended settings and If you already have account in Prey, just sign in or Create a New account as NEW USER. This account is Compulsory to track your Lost Laptop or Mobile. After Creating the account you will receive an email with Conformation of creation and Link to login Prey web user interface. Now your account is Set. Now all Set. Now we can see how these settings used for. If Your Laptop is Stolen, WiFi auto connect feature connects automatically to the near open WiFi spot to gain the Location through IP address. This option helps to identify the Location. Next Enable Guest Account, This one helps to find the Thief you stole your laptop. Yes, If the guest account is enabled, he will use the computer and our laptop will take the Picture of him through the Web Cam and Monitors what he is using, If he sign in to his Gmail or Facebook, We can grab his whole Identity. Extended headers option allows you to additional information regarding our laptop or PC. Now configuration is Over, Now lets see how to Track your Laptop if stolen. 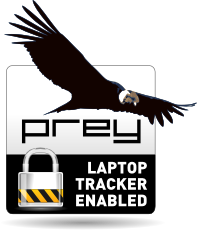 If your laptop is stolen, just go to some other Computer which have internet access and open the Prey Web user interface http://control.preyproject.com and sign in with your account which you created while installing the prey client in your laptop. Now you can see the Options for tracking, Lets see one by one. First you have to change the MISSING option to ON. 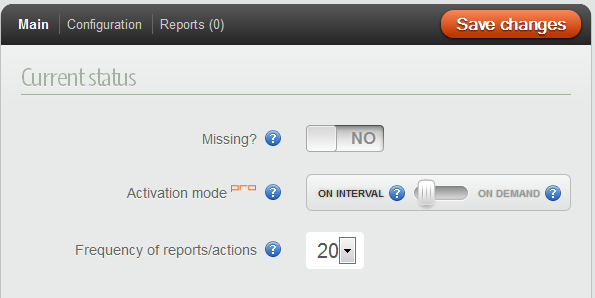 Then default Activation Mode is set as ON INTERVAL. Only Pro users can avail ON DEMAND function. Click here to Check Pro Plans. Set the Frequency of reports you have to get from your laptop. Now we have to set the options to gain information from our laptop, So set the GEO option ON which grabs the exact location if GPS is available in your device. Set NETWORK option ON and Set all sub options Get Active Connections, Get Nearby WiFi hotspots and Trace routes to ON. Even you can Alert the Thief about and Lock down your whole Laptop unusable by using Alaram, Alert, Lock and Secure options, but i don’t recommend to to this until you find the thief identity or if necessary. Even you can show the Alert Message using ALERT option. 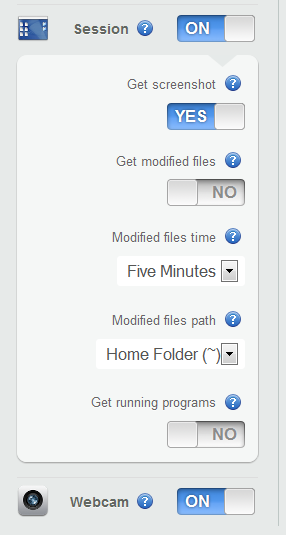 In this Sessions section, you can get list of Modified Files, Running programs, Screenshots of Sessions running on your laptop, its easy to identify, if thief sign in any of his social media or mail services and Even you get the Thief’s photo by using your Laptop Web cam. so i recommend you to Set All options to ON. Now after Finish Configuring, Click SAVE CHANGES in above and Wait for the Mail which contains the Location, Picture of the Thief, Screen Shots of the Sessions and more. Now just forward the information to Local Police and Stay relax. Any doubts? Post in Comment Section, We are glad to help you. Hope you like my post. Stay tuned for more information. I’m loving this tool at the security point of view. I’m gonna try this thing out and the best thing about the post is, “Enable Guest Account”. That is a great way how you phish back the thief so that he don’t have to go through the trouble to crack your account password. This is great idea but what if laptop is stolen and now we want to track it? In this case, ISP could help us because no one steals the laptop and it becomes stand alone. When internet is used, we could track the MAC address if ISP will help us. After a long time seeing one great title here. Keep bringing more similar to this. Cheers. Now this is very useful…keep sharing such helpful info. Yep Prey is one of the best software for tracking lost laptops.One of my friends track down his stolen laptop with that thief red handed.Thanks prey. What will happen if the thief steals and doesn’t connect to internet and formats the computer? How shall we track it?